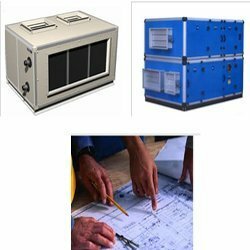 Since our inception in the year 2008, we are engaged in providing Designing, Fabrication, Installation Services for HVAC. Services offered by us encompass HVAC Projects, HVAC/VRV Projects, HVAC (Heating Ventilation Air Conditioning), Railways HVAC Projects, Central Air Conditioning Plant HVAC Installation Services & Designing and Commercial HVAC Installation Services. Furthermore, we undertake HVAC Installation Services, HVAC Project Services, Industrial HVAC Fabrication Services and Industrial HVAC Installation Service. Instead of these all we are also trading HVAC Products to our clients. Our client centric, reliable and time bound services cater to hospitals, corporate houses, offices and MNC's. With clients spread across divergent industrial sectors, it is very essential for us to maintain consistency in the quality of services offered by us. For that matter, we employ an effective quality management system while undertaking any of our business operations. Appreciated for beyond the brief approach in our services, we have been given the credential of keeping customer satisfaction at the core of our organisational agenda. Owing to our quality services and customer centric policies, we have managed to garner a rich clientele, which includes Nirula's Restaurant, Fore School of Management and Sitaram Bhartia Hospital, among others.